← How Many of 2017’s Retail Bankruptcies Were Caused by Private-Equity’s Greed? In the Florida Keys, where major devastation occurred when Hurricane Irma hit the area on September 10 as a Category 4 hurricane, the schools remain closed and will begin to reopen on a staggered basis beginning Monday. 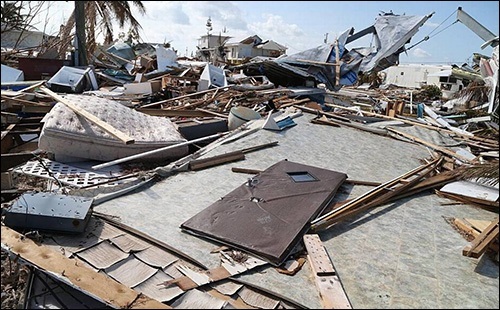 The Miami Herald’s digital edition today shows a photo of the devastation unleashed on Big Pine Key by Hurricane Irma, which made landfall at Cudjoe Key, approximately 20 miles north of Key West. Monroe County, home to the Keys, estimates that 20 percent or more of the homes in the Keys were badly damaged or destroyed. As millions of impacted Americans attempted to assist others and rebuild from Hurricanes Harvey and Irma, another monster Hurricane hit Puerto Rico yesterday, Hurricane Maria, leaving it darkened and without any municipal electric power whatsoever. The U.S. Territory was still attempting to recover from damage caused by Hurricane Irma, which had brushed the northern side of the island two weeks earlier, when Hurricane Maria hit as a Category 4 hurricane yesterday, the strongest hurricane to make landfall in Puerto Rico since 1932. The extent of the devastation there is still uncertain. The San Juan Daily Star newspaper’s website shows that it was last updated two days ago, on September 19. Last evening, weather officials reported that “catastrophic” flooding was occurring in parts of Puerto Rico. 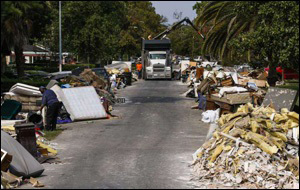 As Americans were attempting to remove water-logged furniture from their homes, rake up debris in their yards, chain saw uprooted trees, repair roofs or, for the more seriously impacted who had lost their homes in their entirety, to find alternate housing for themselves and their families – along comes a devastating magnitude 7.1 earthquake in Mexico which has thus far left 245 dead in central Mexico, thousands injured, and dozens of flattened buildings with an unknown number of people still waiting to be rescued. Since Hurricane Harvey made landfall in Texas as a Category 4 hurricane on August 25, Americans have experienced an unrelenting cascade of news of these epic disasters. Almost every American has a family member, friend or colleague who has been impacted. But as the 24/7 news cycle and its vivid images of the human suffering emanating from these disasters took its emotional toll on caring Americans, the President of the United States, Donald Trump, failed the nation as a leader in this time of crisis.